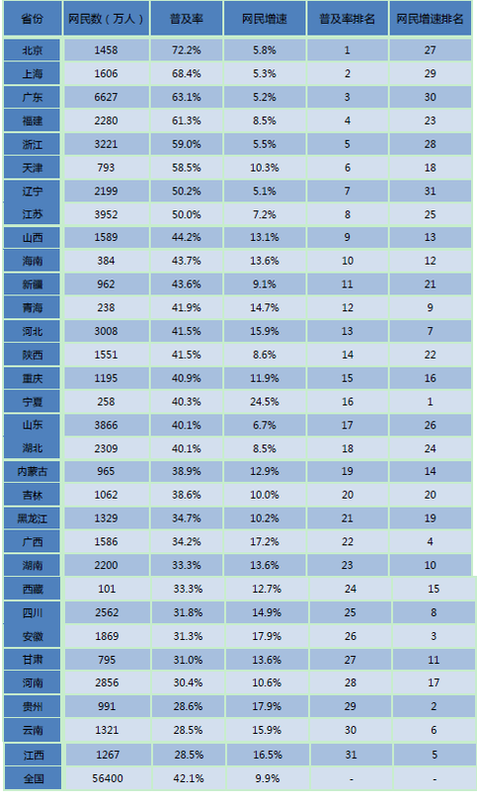 China's national average of internet utilization was still 42.1% in the end of 2012. So there is a lot of chance in Chinese internet market still now. Yesterday, I introduced the summary of "The 31th Statistical Report on Internet Development in China" by CNNIC. And this report said that the internet users in China were 564 million people, and mobile internet users in China were 420 million people as of the end of 2012. So, I will introduce the three detailed matters of this report today. 1. The diffusion rate of internet by area in China. Watching this data, we can understand that China is not the one big market, and China is the aggregate of each many small(but actually big) markets. Each cities have the difference of diffusion rate, growth rate and its circumstance. I think that still exists a lot of chance at the inland areas of China in future. 2. 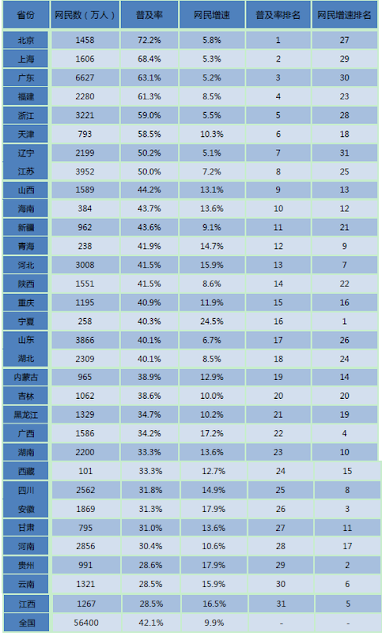 User number and utilization rate by each internet services in China. 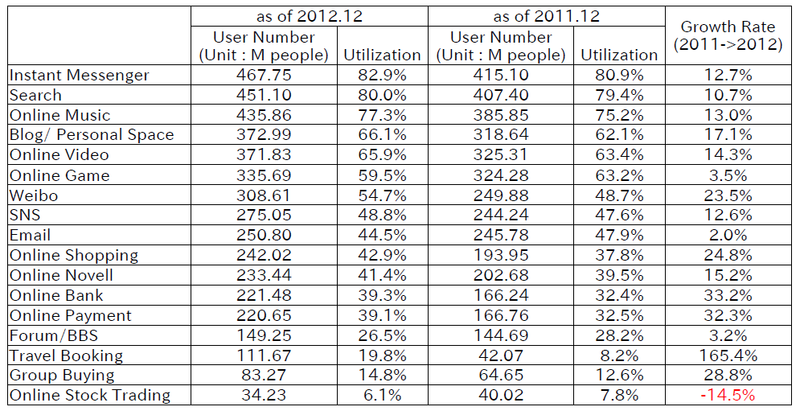 The top place of user number and utilization was still Instant Messenger as same as the end of 2011. WeChat is rapidly growing as I said before, and QQ also continue to reign as the king of internet services in China still now. And "Search" is the second place in this data. Baidu still dominate about 65% of this market as I explained before, Qihoo 360 is magnifying their market share from second half of the last year. So the battle of this market is worth for keeping eye on this year. Weibo and SNS was each ranked seventh place and eighth place. 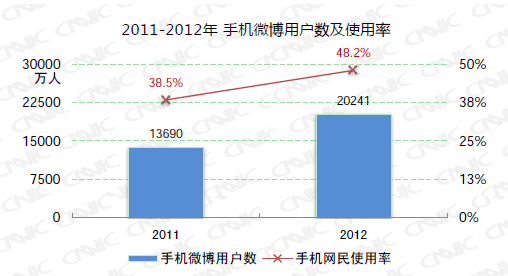 The growth rate of Weibo users were 23.5%, but this number is dramatically down compared to the end of 2011(296%). 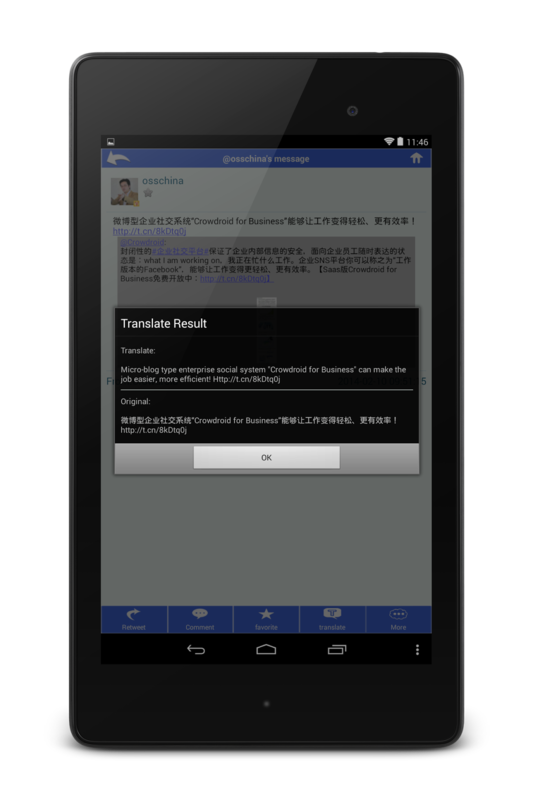 As I explained before, this year is still the challenge year regarding Weibo. 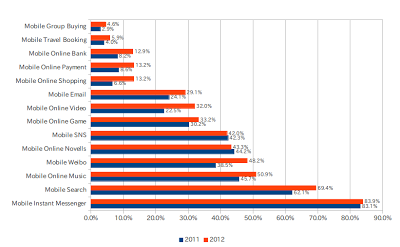 And other remarkable point is that email utilization is still less than Weibo or SNS. I explained before that Enterprise Social Networking is suitable to using in China, but this is also one of the evidence for this. 3. 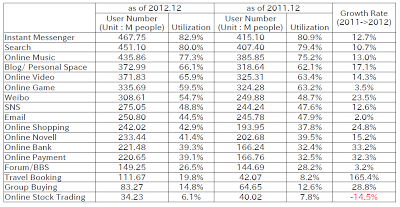 The user number and utilization of each mobile internet services. In this data, there are 5 mobile internet services that growth rate was over than 5% compared to the last year as follows. Especially Mobile Weibo user was increasing about 65.51 million people compared to the end of 2011, and their users number was 202.41 million people in the end of 2012. 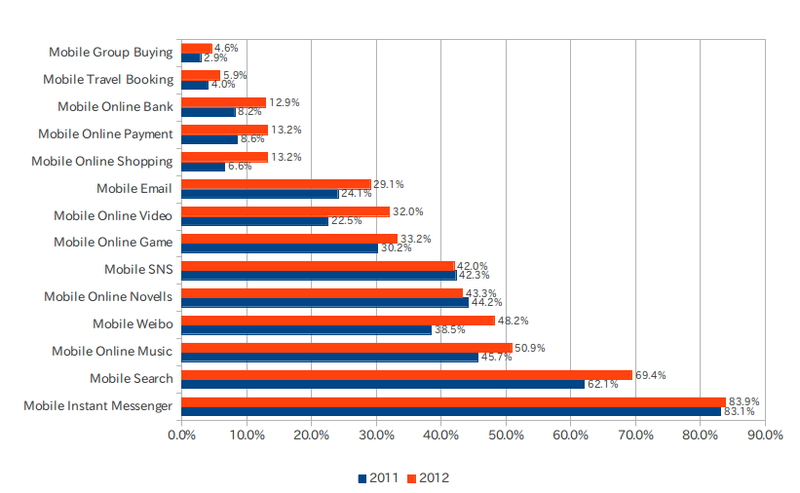 So it can be said that "Mobile Solution" and "Overseas deployment" are very important key factor for Weibo this year.